Abigail Swain climbed the steep path up the Popsquatchet Hills to the new mill where white sails whipped in the southwest breeze, turning the shaft that set the interior gears in motion to activate the granite mill-wheels. Her husband, Eliakim, and his partner, John Way, supervised the grinding of sack after sack of corn, producing the yellow meal used in every island kitch­en. Swain and Way were the first owners of the Old Mill.Tradition tells us that a man named Nathan Wilbur built the mill in 1746, but there are more unan­swered questions about this Nantucket Historical Association property than about any other. We wish Abigail could have described the mill in detail for us, because we aren’t certain what it looked like in the mid-eighteenth century. The mill as it stands today is a smock mill — a tapering octagonal tower with wind vanes that project from a rotating cap. 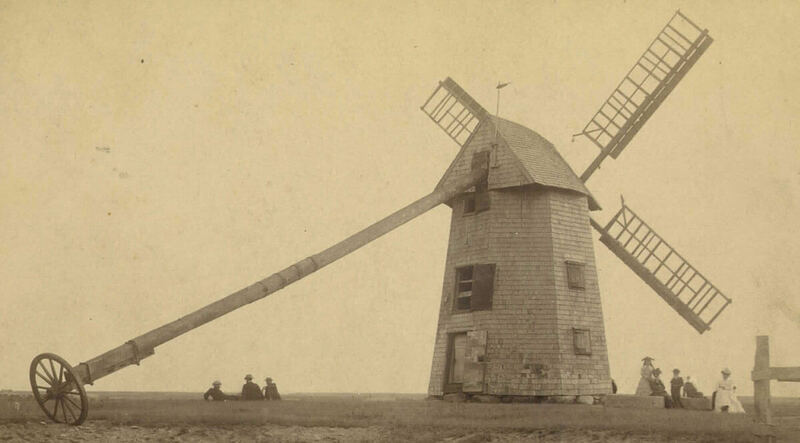 Yet two important early depictions of Nantucket’s windmills — a 1772 map by James Tupper and a circa 1811 oil painting by Thomas Birch — show it as a post mill, a more ancient design where the entire structure, el­evated on a stout post, could be rotated to face the wind. No written records survive that say the mill was rebuilt, and the structure of the mill itself offers no clues. The 1746 date of construction is based on numbers inscribed on the stone doorstep, the one piece of evidence that appears irrefutable. The Old Mill is a grist mill, used to grind corn. That there were five windmills on Nantucket demonstrates the size and value of the island’s corn crop (which may have been supplemented by imported corn) and tells us something about the diet of eighteenth- and nine­teenth-century Nantucketers, who depended on Johnny Cake, Hasty Pudding, hominy, Indian Pudding, cornbread, and cornmeal mush as tasty staples to round out a meal of mutton or chowder. During the remainder of its working life in the nineteenth century, the Old Mill was in the hands of mariners-turned-millers from Nantucket’s thriving community of immigrants from the Azores. The New Guinea neighborhood below the mill was home to George Enos, a mariner from Flores who purchased the mill from Gardner’s heirs for $150 in 1854. In 1865, he sold “said Mill, which has been used for Milling pur­poses from time immemorial” to John Murray, another Azorean mari­ner, from the island of Graciosa, for $850. The increase in the value of the mill during the period of Nantucket’s severe economic depression at the end of the Civil War is telling — out of necessity the island had rediscovered agriculture when whaling ended, and as the last mill in operation the Old Mill may have gained value; perhaps Enos made expensive repairs to the structure, too. Murray must have recognized the importance of the mill, selling the property a year later to Francis Sylvia, a mariner from Faial, for $1,200. Sylvia was miller when Nantucket blossomed as a tourist destina­tion Francis Sylvia saw where the real profit of owning a mill might lie. In 1881, he advertised: “Stereoscopic Views of the Old Mill have been issued by the subscriber, and are on sale at the mill and at his residence on Back Street.” Later, he added some Azorean items to his mill gift shop and invited his summer friends to buy souvenirs. Sylvia became the subject of paintings, and his photograph was taken wearing a straw hat that may have come from his home island. He owned the Old Mill for thirty years, from 1866 until his death in 1896. Caroline L. W. French of Boston, one of the benefactors of the Nantucket Historical Association’s purchase of the Quaker Meeting House on Fair Street in 1894, made it a condition of her donation toward securing the meeting-house that the association raise a reserve to purchase the Old Mill should it come on the market. As a result, when the mill did appear at auction in August 1897, the association had most of the necessary cash in the bank and was able to acquire the landmark struc­ture for $885. The winning bid also secured for the NHA a one-and-a-half-acre lot on the hillside below the mill, now known as Mill Hill. After some minor repairs over the years — and major overhauls in 1930, 1936, and 1983 — the mill is capable of grinding corn just as it did two hundred and fifty years ago. Believed to be the oldest American windmill in continuous operation, the Old Mill was desig­nated an American Society of Mechanical Engineers (ASME) Historic Mechanical Engineering Landmark in 1992. Excerpt adapted from the Nantucket Historical Association Properties Guide, Old Mill by Betsy Tyler, 2015.